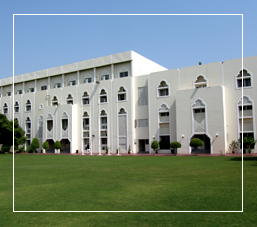 The school is primarily intended for Indian children. All children are expected to follow the curriculum prescribed by the Central Board of Secondary Education, New Delhi. Applications for admission should be made on the prescribed form by parents or guardians who will be responsible to the head of the school for the pupil's conduct, de-portment, punctuality, regular attendance, progress in school and payment of fees, and other matters. A child must be three years old on 15th March of the school year before he/she can be admitted to the Lower K.G. No child who has not completed 5 years will be considered for admission to Class 1. A corresponding scale of age is fixed for the successive classes. A pupil will be given a test at the time of admission. The decision of the school authorities regarding the entrance test shall be final. A pupil who joins the school for the first time must produce a photocopy of the official birth certificate and passport, as evidence of the date of birth entered in the admission form. A child coming from another school must produce a transfer certificate from the school last attended, duly countersigned by the education officer or the competent authority of the area.